Round 7 of the 2018 EUROPA cafe W.A.R.S. 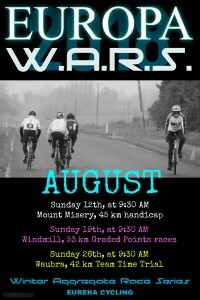 saw fifteen riders head out onto the Mount Misery course for a fast and furious 45 kilometre handicap. Sunshine bathed Lake Learmonth, however Bill Goldfinch remembered to flick the “wind” switch before leaving the club rooms. The strong westerly had kicked in by the time the riders were warming up along Weatherboard Road. So strong, the magpie darn’t swoop the lycra warriors. The wind was quickly evaporating the puddles out on course left from the overnight rain, actually, maybe it was just blowing the water away. Graeme Parker rode off in Limit in a solo capacity at 23 minutes. This has become a familiar sight throughout 2018. Graeme’s regular partners have raced less frequently. We should never underestimate just how tough it is to ride an Individual Time Trial nearly every week. It is only a matter of time before a windless race day arrives. We won’t see Graeme until post race on that day! The Handicapper has paid close attention to Roger McMillan ever since he won bronze in the Division 2 Club Criterium Championship. That kind of form does not go unnoticed, even if it was four and half months ago. Brought back in to 12 minutes, McMillan also rode off alone, with an ever watchful eye towards the road behind, in anticipation of the inevitable catch. The largest group of the day rode off at 8 minutes. The middle bunch were five strong and fielded some big engines. 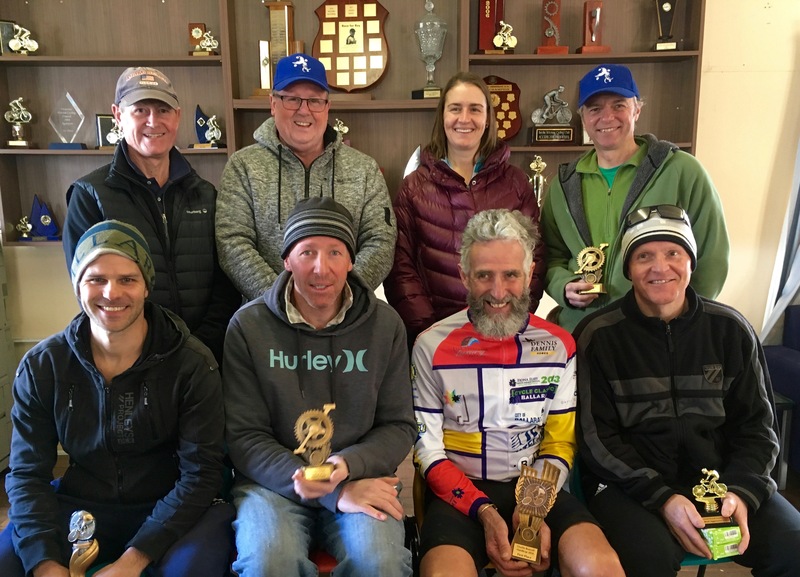 Michael Veal was racing – moved out a whopping 6 minutes since his last race – with ample support to be provided by Mark O’Callaghan, Bob Morley, Jeremy Humber and Peter Livitsanis. A good day in the making for Livitsanis, with plenty of lycra to shelter behind! Second Scratch rode off at 2 minutes and saw the return of Rob “Big MiG” Phillips. The inform Andrew Rushton was out for more success. Dean Wells and the ever improving Jason Hendry just there to make up numbers. Could the quartet keep Scratch at bay for a third race in a row? Scratch was Shark free (no Tim Canny) again, however that didn’t mean an easy ride was in store. Lindsay Burgoyne is in sparkling form as his trip to Italy and the UCI Grand Fondo World Championships looms. He was all the more eager to strike a winning blow today after an untimely location error cost him dearly at Paraparap the week before. Tony Mirabella was keen to atone for his mechanical incident the previous week, but would he be fit enough to match the young guns? Jason Birch and Craig Lee planned to hit the tarmac hard today. Game plan = Rip as much time as possible out of the leaders into the headwind, then smash it home with the tail! With few bunches out on the roads, it was difficult to work out how the race was panning out. The westerly provided a tough head wind all the way from Addington to Black Bottom Road. The groups battled to hold their numbers intact. The solo riders just battled. Passing Waubra the 2 minute group could sense Scratch closing on them fast. The catch was made just 17 kilometres into the race and added more firepower to the flying Scratch riders. Up the road, McMillan had joined ranks with the 8 minute group. Parker was still out in front. Sweeping onto Black Bottom Road brought a new challenge with the right to left cross wind. On the narrow sections their was barely enough tarmac for more than four riders to echelon across. This proved especially dire for the combined Scratch bunch. Phillips went out the back and Rushton followed soon after – particularly cruel after having just done a turn on the front. Scratch motored on with Lee ramping the pace up each time he hit the front. Burgoyne was strong in his bouncy way. Birch was more grounded and just as strong. Mirabella managed his pace, wary that Lee’s speed might blow the bunch apart. Wells did the odd turn. Hendry was glad just to hang on. Nearing the Ercildoune Road intersection, Scratch could see the 8 minute bunch ahead. It was only a matter of time now. Onto Ercildoune Road and Lee put the afterburners on with Burgoyne. Birch and Mirabella swapped turns and the pace stayed high. Ahead and Morley put the call out to the bunch that Scratch were coming. The pace went out of the bunch, maybe too much. Humber eased off the back to give himself room to latch on. Whoosh and Scratch were through. The 8 minute bunch all jumped aboard. Straightening up on Ercildoune Road and some big efforts from the Scratch men saw the screws tighten just a fraction too much and the 8 minute riders started popping off the back. Humber, his eyes on the overall W.A.R.S. title, held fast. His former mates all left in the wake. At the front of the race Parker knew they would be coming for him. If he could just make it up the hill to Weatherboard, well, maybe he would have a chance. Scratch were still plying on the pressure – at least those who thought there was another bunch up ahead were. Lee and Birch were happy to let those other guys do the bulk of the work, they knew Parker was the only rider up the road. With 6 kilometres remaining, Scratch caught and passed Parker. Wells was on the front and took the bunch up the hill towards Weatherboard. Eventually the whole group was made aware they were at the head of the race. Wells powered on – knowing he’d blown it again – the rest of the bunch more than happy to sit on for the free ride to the finish line. Past the Avenue, down the dip. The race was going to finish in a sprint. Hendry launched very early, not sure how long his sprint would last, or exactly where he needed to go from – rookie mistake. Lee and Co. just followed his wheel then sprinted when the time was right. Burgoyne, Mirabella and Humber threatened for the barest instance before Lee and Birch got their gap. The drag race was on, but Lee had the lead by a bike length and held his upper hand to the line for a deserved First and Fastest. Sunday 5th August brought strong winds which whipped through the middle of Victoria causing havoc and resulted in many sporting events being cancelled. Most southern regions were spared from the wind and rejoiced in the warm sunshine which in fact reached all corners of the state. Weather aside, the eyes of the sporting world all turned towards Paraparap for the fourth edition of the Rocket Ascent, sponsored by Rocket Tyres. 62 kilometres of rolling, tree lined, handicap fun, with two ascents of the infamous Gum Flats Road climb thrown in for good measure. 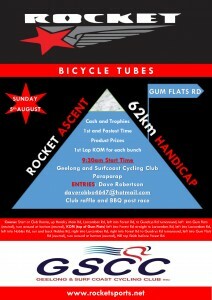 Geelong & Surf Coast invited Eureka Cycling to join in the fun and we duly obliged. Fifteen Eureka members (and one potential member) entered for the day. 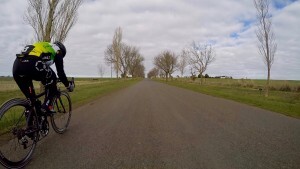 Unfortunately the strong winds around Ballarat discouraged a few riders from making the trip down to Paraparap and so only thirteen took their place in the field. A neat fifty riders signed on, then listened into the pre-race brief which explicitly stated that the down hill part of Gum Flats Road was neutral…on both laps! Right?! Geelong and Surf Coast’s very own Ken Mansfield led off as the lone Scratch rider at 48 minutes. It was a long twenty one minute wait until the 27 minute group headed off. Eureka’s first rider was on the road – Jacqui Dawson. Three GSCC riders accompanied Jac into the bush. Another lengthy wait before the largest group (ten riders) of the day at 17 minutes. Eureka fielded James Burzacott, Roger McMillan and Tim Tyler in this group. GSCC’s Jamie Robinson provided a very familiar wheel for the Eureka riders to follow. An interesting rider in this group was the “trial” rider from Ballarat and former triathlete star – Melissa Burgoyne. One of the StoreIT team members, Melissa will soon be heading off to the UCI Gran Fondo World Championships in Varese, Italy with a bunch of crusty old men from StoreIT…but that’s another story. 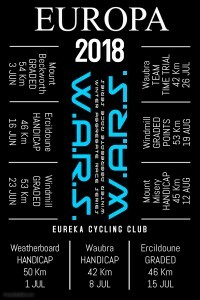 The 13 minute group fielded Bob Morley from Eureka – who is still on somewhat of a statewide victory parade after recently winning a virtual race on Zwift. Up against seven GSCC riders, Morley was keen not to get played by the old “one-two”, or even the “one-two-three-four…” you get the idea! He would certainly be keeping a close on on the likes of John Parello, Gavin Gamble and of course Carl Judd – even if it was only for wind direction changes according to Juddy’s moustache. The 9 minute 30 second group had some pretty well known names in it’s midst. GSCC’s Marcus Coppock, Darren Williams and Chris Fenech, were just a few of the likely fellows to dish out some pain. For Team Eureka we saw Andrew Rushton who was very aggressive in the previous week’s Charlie Braszell race. There, he blew up up at the base of the climb to the finish line. What would two ascents of a more difficult climb yield? Team Eureka also had Rick Calvert returning to racing. Nearly four months ago Calvert crashed on slippery roads and suffered an arm injury. With a European trip looming – as well as a plan to climb some of the biggest Alps he could find – Calvert used indoor virtual training to get himself fit. His preparation paid off and he thoroughly enjoyed riding up some massive mountains such as Mont Ventoux…three times…in one day…yes, that’s nuts! It was fair to say that Gum Flats Road would present no issue for Calvert, but how would he go with the speed of a race? Six riders set off at 7 minutes. 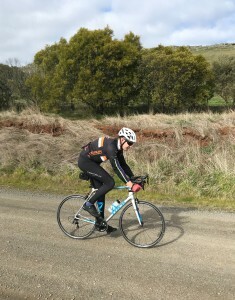 Like Morley, Eureka’s Lindsay Burgoyne was isolated amongst GSCC riders. Daryl Suter, Nigel Pearson, Dave O’Neil, Dave Warren and Harvey Lang were all planning a big day out. Another group of six for Second Scratch off at 4 minutes. GSCC stalwarts Rick Buckwell, Kane Airey, Nick Brown and Tony French riding with Team Eureka’s Tavis Baker and Dave Ogilvie. A strong Scratch bunch led by GSCC’s Rob Southern, with Greg Hosking, Andrew Goodwin, Brad Haskett and David Newett in support. Eureka adding Tony Mirabella and Craig Lee to the fold. To the race proper and the front of the field was coming together quickly. The 13 minute bunch had set off at a reasonable clip, however at the first turnaround (Grundy’s Road) they were red flagged – it cost them valuable time. Once outbound, they could see the 9:30 bunch closing quickly. For their part, the 9:30 group had worked well together up until the first ascent of the Gum Flat Road climb. Three riders broke away early on the climb. Rushton and a few others chased them down. The bunch had been split though. Over the top they had six riders in hot pursuit of the 13 minute bunch. The round up occurred before the left turn at Larcombes Road. The race was on with the 9:30 riders trying to drop the 13 minute riders. Scratch had lost Mirabella inside the first 20 kilometres with a flat tyre. The chase was just a bit more difficult now. Rushton however, was a man on a mission and the enlarged group was desperately trying to stay away from the 7 minute group who were closing. The group continued to swell as the bunch collected riders who had been dropped from the 17 and 27 minute groups. Burgoyne hammering away on the front of the 7 minute bunch was a common sight. At the Nobles Road turnaround the gap had decreased even further. The 9:30 (plus hangers on group) caught the lone race leader heading south along Forest Road. The 7 minute group were close enough to catch the sweat from the new race leaders. Through the Grundy’s Road turnaround and the catch is finally made. The lead bunch has over twenty riders in it as they head back towards Gum Flats Road. Hey, there goes Scratch…we have them covered! Rushton was still on the front giving it everything. Down to the last two kilometres and John Parrello rushed off the front and took the left turn to the steep downhill well clear of the pack. Local knowledge coming to the fore! Riders jockeyed for position as they went down, down…in a controlled “neutral” roll…some positioned well, others were shuffled backwards. Parello got around the turn first and Morley was next. Rushton was third into the turn and came out of it on the 53 chainwheel ready to power up the hill. Calvert came through the turn almost last. Would the recent mountain training pay dividends? Up ahead and Rushton has closed on Parello. Here comes the 10% section. The effort is more a grind than a sprint. Rushton has the lead. The gap is opening. 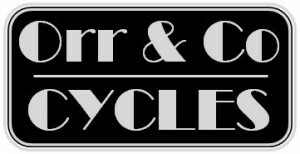 Pearson and O’Neil (both 7 minute group) are the next riders. Calvert has passed rider after rider. He can’t reach the three ahead, but he can finish high. Behind Calvert the others are starting to pedal in squares. Rushton is well clear at the line and wins by ten seconds over Pearson. A few bike lengths back to O’Neil and the same to Calvert. 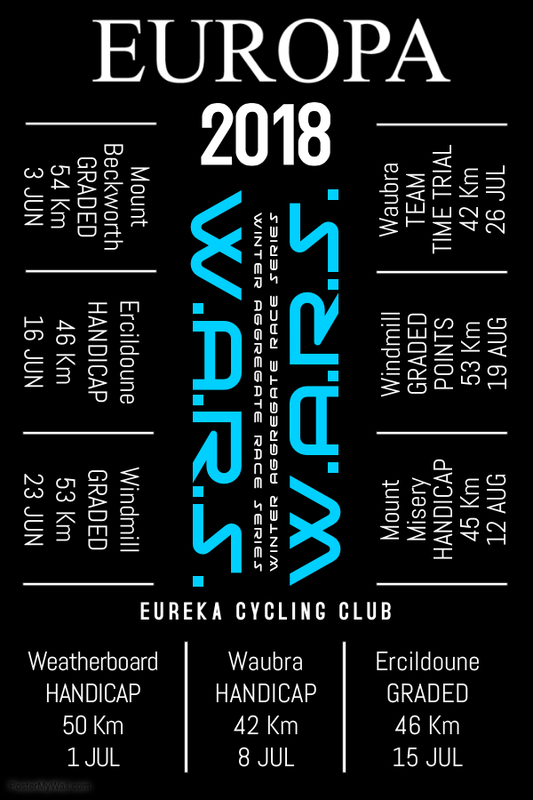 Many Eureka riders finished high in the order with Burgoyne 6th, Morley 8th and Melissa Burgoyne rode brilliantly for 10th, First Lady and KOM in her group. Melissa relinquished all those honours because she was on a trial ride. Tyler was officially in 10th place, with Burzacott not far behind. Less than three minutes later the Scratch riders climbed for Fastest Time with Greg Hosking claiming the prize convincingly. 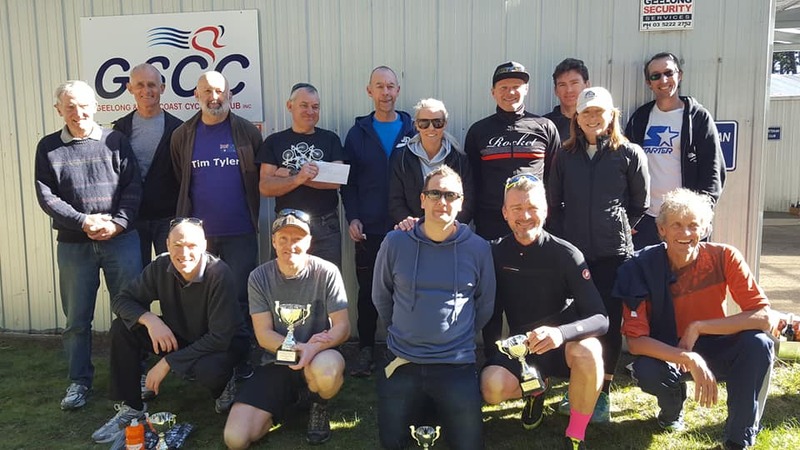 Post race and Rushton pulled off the perfect double when he claimed first prize in the raffle and received a whole bunch of goodies to go with his trophy, prize money and KOM for leading his group over the climb the first time around. The forecast was correct for the Charlie’s race. The short break in the weather (we use the term “break” very loosely!) would allow for the staging of the 2018 Charlie Braszell Handicap, in relatively good conditions – compared to what would sweep in during the afternoon. The fair “west north west” wind dropped the “feels like” temperature to zero, however the rain stayed away and allowed good viewing for the spectators who navigated the circuit in their warm cars. Geoff and Neil Braszell were out on course monitoring the events of the day. 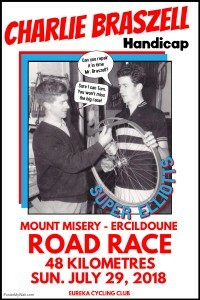 We thank the Braszell family for kindly staging this most important race for Eureka Cycling. The trophies and prize money the Braszell family have supplied over the years is a wonderful and kind gift. We are very fortunate for the opportunity to race is Charlie’s honour. 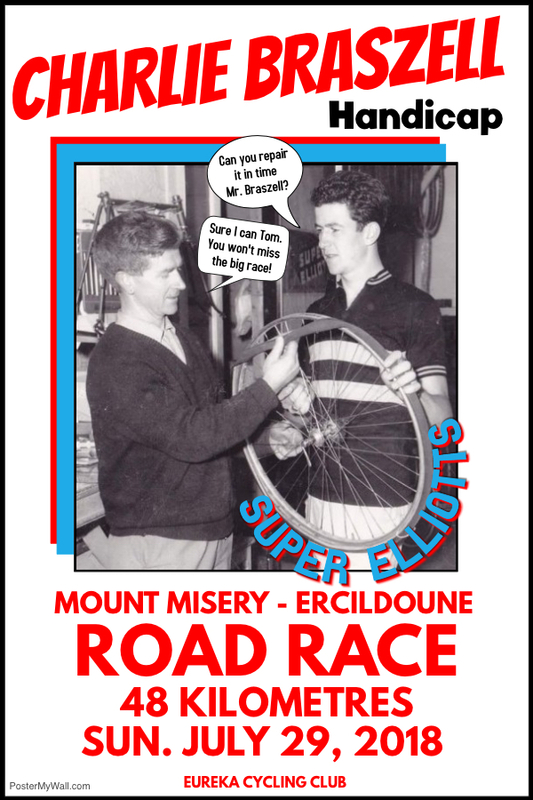 Twenty hardy souls signed on for the 47.5 kilometre test around Mount Misery with the finish atop Harrisons Road (Ercildoune). Not all twenty riders completed the circuit though. Graeme Parker headed off as the lone Limit rider at 25 minutes. Five minutes late and Jacqui Dawson also headed off in a solo capacity. The strength sapping wind would make life difficult for the two out-markers. Would they be able to hang onto any group that catches them out on the road? The 13 minute group was stacked with seven riders. The main question was would they be able to keep themselves as a bunch and use their strength in numbers to hold off the chasers? Jude Jonasson was back for her first road race in a while. There were questions asked if the Princess Warrior would be up to the task. Roger McMillan and Phil McLennan were also promoted to the group. The rest were the usual cohorts, however each would have to be on-song to threaten today. Peter Livitsanis had flatted early in the previous week’s GP Doug Garley and Danny Whelan had endured a horror day at the office in the same race. Mark O’Callaghan is on the comeback trail from some niggling injuries and James Gretton has never made it to Harrisons Road in any race that includes the infamous hill top finish. Four riders made up the 7 minute group. Looking at the deficit they had to make up on the bunch ahead had them worried before they had even started. James Knipe, Jeremy Humber and Grant Dawson were joined by Steve Biram who hasn’t raced for a few weeks. What would their day look like? Second Scratch rode off at 3 minutes under the leadership of Dean Wells. Jason Hendry would provide some good engine power and Andrew Rushton rounded out the group. For this trio it was just about holding Scratch off until at least Black Bottom Road. Scratch was led out by pre race favourite – Craig Lee. The rest of Scratch are in various stages of race fitness. 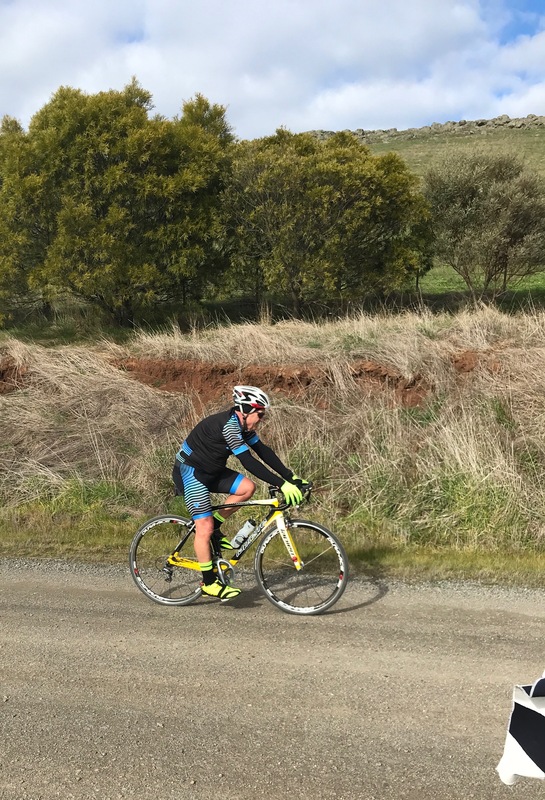 Tony Mirabella is gradually building his fitness towards the Championship races that are being staged at Learmonth in October and November – he is a man with a long range plan! Lindsay Burgoyne is reaching peak fitness in preparation for the UCI Gran Fondo World Championships in Varese, Italy next month. The final member of the quartet has only been a member with Eureka for a few months. He circled every “hill” race we have and is targeting each of them. It is only a matter of time before Dave Olgilvie wins one of our hill classics! Out on the circuit and Jacqui Dawson was slowly closing Graeme Parker. The climbing and wind on the first part of the circuit was taking effect and the 13 minute group already had them in their sights. Danny Whelan is doing all the damage. He is driving his bunch relentlessly. The others are swapping turns when they can, but it is Whelan who is keeping the pace high. McMillan is lost to the group. The 7 minute group lost Biram inside the first two kilometres. They are being reeled in by Second Scratch at a steady pace. Scratch are taking time out of the 3 minute group, however it isn’t as quick as they had hoped. They are desperate to catch the “chopping block” before the Mount Misery climb at the back of Waubra, however at this rate they may not catch them until Black Bottom Road. Each group on the road enjoyed the tail wind down Black Bottom Road. Speed was the key. Pedal hard because you can bet that everyone behind you is! Turning onto Ercildoune Road and the 13 minute bunch lose Gretton. McLennan is the next to drop off. They have started to whittle down, will they have enough firepower to stay clear of the chasers? Second Scratch has caught the 7 minute bunch and enlisted their help. Scratch are on their way, however they can barely see the bunch ahead. The race is coming together in spits and spurts. All the momentum seems to be with the 13 minute bunch under the guidance of Whelan. Wells and Rushton are driving their large bunch. Hendry is strong. Dawson, Knipe, Humber and McMillan (where did he come from?) are all swapping turns. The pace is high, then the wind and bumpy road disrupts the flow. Wells and Rushton go back to track turns – hold on everybody! Scratch are closing slowly. Things are starting to look dire. Will they run out of road? Parker still has the race lead. The 13 minute group close upon him like a tsunami. They have the lead before the Weatherboard climb. Hold it all together up the climb? Nah, let’s ride. The new leaders charge up Weatherboard making every post a winner. They crest the climb and get back into rhythm. Jonasson (any doubts have been scoffed at) is swapping turns along with Livitsanis and O’Callaghan, however it is Whelan who is guiding this rig. Second Scratch are cruising up Weatherboard. Glances over the shoulder reveal an empty road. Where is Scratch? Scratch riders are getting frustrated. They are surging and easing. The differences in race fitness are showing. It should be smoother, it’s not. Edmonston Road and the wind is blasting the leaders again. Whelan suddenly moves to the right in a Saganesque move. The bunch scatters like pins in an alley. Jonasson loses the wheel in the fracas to find Whelan’s wheel. The gap has opened. The chasers are onto Edmonston Road and the gap is about 600 metres to the leaders. The leaders are over the crest. Downhill to Harrisons Road and the climb. They have a 500 metre gap. 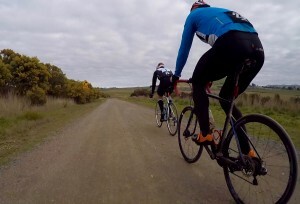 They swing onto the climb and straight into a headwind. The first of fours steps looms. O’Callaghan is dropped. It’s a race in two, Whelan v Livitsanis. Rushton is driving Second Scratch as fast as he can towards Harrisons Road. Some confusion at the turn as Hendry and Humber are a little unsure of the turn. Rushton shouts out “Every man for himself”. He is spent. The bunch blows apart. Wells is in pursuit of the leaders. Whelan and Livitsanis are marking each other as they come to the second step. Whelan accelerates and creates a gap. Livitsanis tries to respond. Then the rain – or is it sleet – hits. The gap increases. Whelan is going for the win. Livitsanis is racing to hold second. O’Callaghan is protecting third. Jonasson is pedalling squares and trying to not look back. Wells is closing on the leaders. Scratch are now on Harrisons Road. Lee and Ogilvie are clear. Everyone is copping the arctic blast. One last step for Whelan. He is racing for his second classic trophy in 2018. He wins. He has earned it! Lee and Ogilvie are racing towards the second step. Ogilvie can’t match Lee he gets a small gap. Lee starts to pull away. At the top of the climb and Livitsanis takes second with O’Callaghan making it across for third. Jonasson holds out Wells for fourth. Hendry is next with Humber and Rushton close behind. Lee is next with Fastest Time. The others come in dribs and drabs. Courtesy of the Braszell family, the top three place getters and Fastest Time all received trophies and prize money. Andrew Rushton received the Most Aggressive Rider trophy. 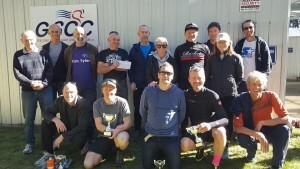 The Charlie Braszell Handicap completed a fantastic week of events for EUREKA Cycling. The GP Doug Garley was raced on the previous Sunday and the club launched its Junior Female Cyclist Support Grant midweek in reverence to the great men of cycling that Doug Garley and Charlie Braszell were. Charlie and Doug were instrumental to the cycling careers of many young riders. Though they may be gone, the deeds of these two great men live on. 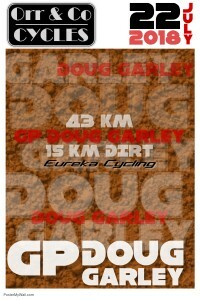 Simply put, Charlie and Doug will always be legends of the Eureka Cycling Club.